Welcome. Hello, almost the end of another financial year! So guess what? Time for a stock take sale. Over the next month we are going to be clearing out some of our old stock that has been sitting here for to long. Have a look below for some examples. We will be listing all the stock in our "Specials" pages by chassis number. So, for example, if you have a W201 keep an eye on the W201 page or if you have a W123 keep an eye on the W123 page, etc,etc. Also when these pages are updated we will be e-mailing all the Newsletter subscribers who have ticked the "Specials" box for that chassis type on the subscriptions page. If you are not sure you can log on using the box in the right hand margin and check your details. Finally news that we are going to sell our Vito 113 Flexivan. This is quite a rare version of the Vito van here in Australia in that it has a removable rear seat so that it can be converted from a van to a family car in under 30 seconds. See the details below in the cars for sale section. I should have made the <?xml:namespace prefix = o />"What the" from the last newsletter to spot the obvious typo! 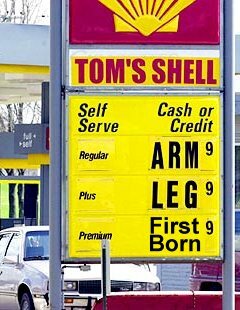 Well done to the Rod Garnett who spotted that 8.33km per liter was not real good consumption figures. Thanks for letting us know. I fixed the typo as soon as I received the e-mail. 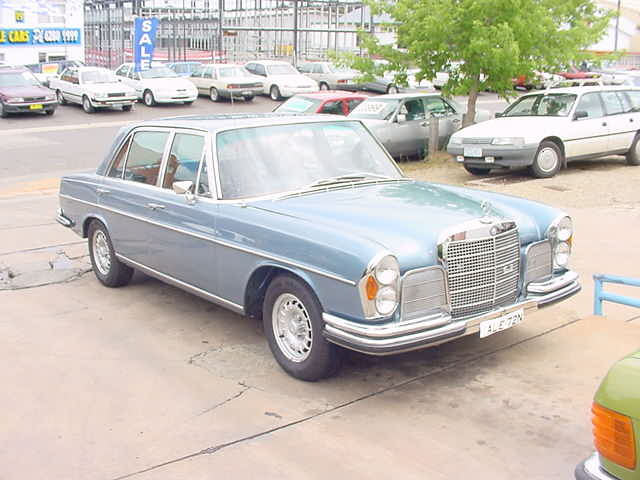 The correct answer to the "What the" was 240D, 300D and 250 as being the three engine variants that you could buy the LWB version of the W123 for. If you are interested in these models we have three of them for sale for $25000.00. You can see the details here. I would prefer to sell all three at once but could be convinced to sell the maroon one for $7000.00. Well done to Dr. Mark Seymour from Dunedin, New Zealand who got it right. The "what the for this newsletter is to have a look at this picture and tell me who did the conversion. E-mail me with the answer here. 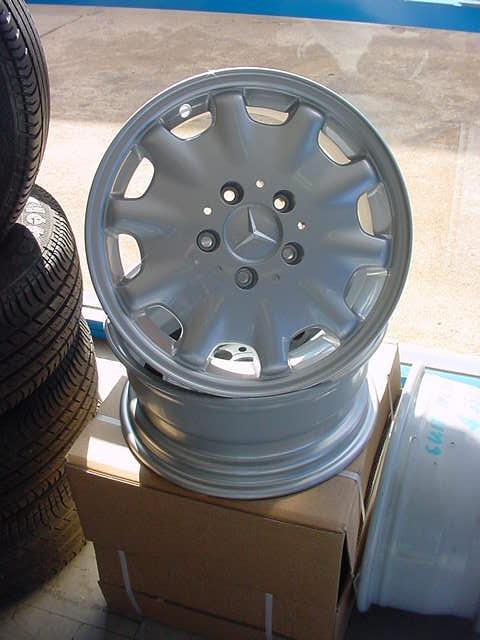 - 15" alloy wheels to suit W124, W201, W202, W210. These are brand new 6.5" by 15" alloys from the W210 range that will fit the models listed above. Normally over $1500 a set of four we are selling them for $899.50 a set of four including the centre caps and studs. At the time of writing this newsletter there were only two sets left. - We have one NEW set of four headlamp beams to suit the W108 and W109 Americana style headlamps at $450.00 the set. This is two low beams and two high beams. These would normally sell for over $750.00 the set of four. - Finally we have a W113 blue soft top in the original German fabric for $1000.00 that would normally retail for over $1500. Here are the pictures from the MBCV afternoon with the SES and there Jaws of life. Remember this 190SL that was on ebay from the last Newsletter? It belonged to a guy I have known for years on the Mercedes Veterans List who is now very ill and only has days to live. He is also the owner of the strange 250SL that we reported on in Newsletter number 32. Frank has been a pillar of the MB online community for many years and I am sure that everybody who has had contact with him over the years will wish his family all the best in these trying times. Are your instruments looks a bit down? Try this link. Want to work on your own car and know what you are doing? Click here to find workshop manuals. The E220 was sold before we even managed to list it on the website! The 320E has also been sold. New cars include a beautiful 300CE, a 190E, a 260E and a very rare E320 coupe. The E320 coupe was the last version of the very popular W124 series coupe and was only sold here in Australia for about 14 months so they are very hard to find, especially in this condition. The 300CE has a few kilometers on it but drives and looks like a car that has done half the distance. Also for sale is our Vito Flexivan. As mentioned above this is a great car for a tradesman who needs a second family car for the weekends. The rear seat is clipped to the floor of the van and can be removed in a matter of seconds. Remember that if you want us to notify you when certain cars come into stock to make sure your details are correct on your subscription page. To change them simply log on (the members log in box is in the right hand margin of every page) and click "Edit your details"
Now we don't normally list customers cars that are for sale but we did get an e-mail from a customer the other day who has to sell his 300SEL 6.3. This car has had heaps of money spent on it and would be worth buying for someone who was interested in a 6.3. If you are interested you can e-mail the owner here.